When teachers talk about what they want for students, "a love for reading” is inevitably near the top of the list. Even as they work to ensure students' continuing progress as readers, what ignites passion more than anything is the chance to instill confidence, curiosity, and joy in students. 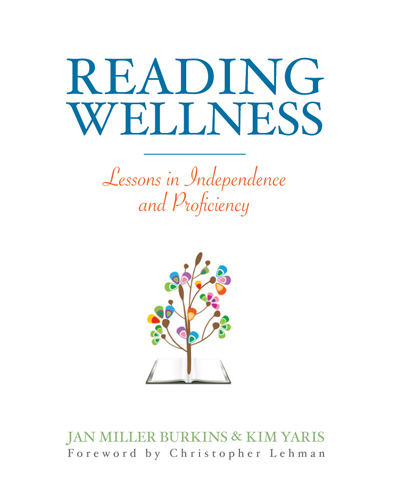 In Reading Wellness, Jan Burkins and Kim Yaris will remind you why you became a teacher in the first place. They want children and teachers to thrive as readers, to feel the deep satisfaction that comes with meaningful encounters with texts. When teachers talk about what they want for students, "a love for reading” is inevitably near the top of the list. Even as they work to ensure students' continuing progress as readers, what ignites passion more than anything is the chance to instill confidence, curiosity, and joy in students. In Reading Wellness, Jan Burkins and Kim Yaris will remind you why you became a teacher in the first place. They want children and teachers to thrive as readers, to feel the deep satisfaction that comes with meaningful encounters with texts. They define reading wellness as "weaving together all the facets of our reading lives ... so that we can be our best reading selves." Readers read for relaxation, for information, and for aesthetic experience, discovering favorite books and authors and learning to choose texts. For this to happen, teachers must teach in ways that create energy and enthusiasm for reading, even as they teach to required standards. Built around a framework of four intentions—alignment, balance, sustainability, and joy—Reading Wellness offers teachers a series of lessons that help children read closely and carefully while still honoring their interests, passions, and agency as readers. The lessons here, which have been field-tested in grades 1-5, are interconnected and empower classroom communities, are filled with anecdotes and insights, and are practical, sustainable, and frequently joyful. Reading Wellness encourages each teacher to shape these ideas in ways that support personal ideals and goals while nurturing a love of reading and a passion for lifelong learning. Jan Burkins, coauthor of Preventing Misguided Reading (IRA 2010), and Kim Yaris are the writers and thinkers behind Burkins and Yaris—Think Tank for 21st Century Literacy, where their blog and their instructional resources have drawn a national audience and made them thought leaders in the field of literacy instruction. Kim Yaris and Jan Burkins are the writers and thinkers behind Burkins and Yaris—Think Tank for 21st Century Literacy, where their blog and their instructional resources have drawn a national audience and made them thought leaders in the field of literacy instruction. Preview the entire book online! Introduction: How Well Are You?